This is not so much an article but more for reference. A while ago the following question from Chris Hebbron appeared on the 'Q&As' page of this site. "Having seen the AEC Regent III RT of Birmingham Corporation on this site, it made me wonder about the circumstances of the supply of these. Also, how many of these quintessentially London chassis were supplied new to other operators. I think some went to Southport or somewhere around Blackpool and one pre-war one went to Glasgow, but was unaware of any others." This sparked off comments from several people listing known Non London Transport RTs this in return intrigued me enough to do a little research of my own and I came up with the following mainly from Mr A A Townsins extremely good book 'British Double Deckers from 1942'. Apparently the first 150 RTs for London transport and the lone one for Glasgow Corporation were delivered in the early months of the war and all had the O661 chassis code same as the Regent I and II but after the war the code for RTs was changed to O961. About 70 of the first RTs were delivered to other operators than London Transport between December 1946 and mid 1947. All other RTs were delivered to London Transport except for the two batches totalling 40 that went to St Helens Corporation in the early 50s. So working on this reliable information there was a total of about 105 RTs delivered to operators other than London Transport. They are camouflaged slightly as the 70 approx delivered 1946-7 were called Regent IIIs, but the O961 chassis code is the give away as the Provincial Regent IIIs which started being delivered in 1947 had the chassis code 0961/2. Below is a list of all the Non London Transport RTs that came to light from comments received. There are a few question marks for missing details if you have the answers please let me know. Other little snippets of information that came up in the comments. Coventry Coporation It is understood that the Coventry RT chassis was built in 1947, along with the other provincial RTs, but stored by Coventry until 1950 when Metro-Cammell bodied the RTLs for London Transport. 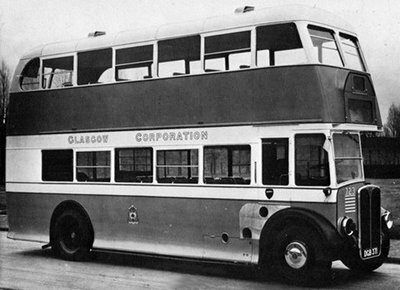 Glasgow Corporations sole provincial pre-war RT which was built to appear at the 1939 Commercial Vehicle Show, which was cancelled because of the outbreak of World War II. It sported a Weymann H30/26R of a style fitted to other Regent I's delivered to Glasgow around that time (the flared bottom was continued after the war). The front blind display shape was pure Cowieson-style and it was probably the last time it appeared. Note it is dressed partly in wartime garb. West Ridings first post war vehicles were the 9 RTs delivered in 1946. It is also safe to assume that these were unique in being the only centre entrance RT's ever built. This shot of another of West Ridings center entrance RTs shows quite clearly the two staricases. This shot of Birmingham Corporations RT GOE 631 fleet number 1631 is the shot that started the question regarding Non London Transport RTs. It looks nothing like the RT that everyone is familiar with. This is a shot of GMN 905 fleet number 54 one of the two RTs that Douglas Corporation took delivery of, the other four Regents in the batch of six delivered in 1947 were of the Provincial Regent III style. The two batches of RTs delivered to St Helens Corporation were exactly the same as the London Transport 3RT. 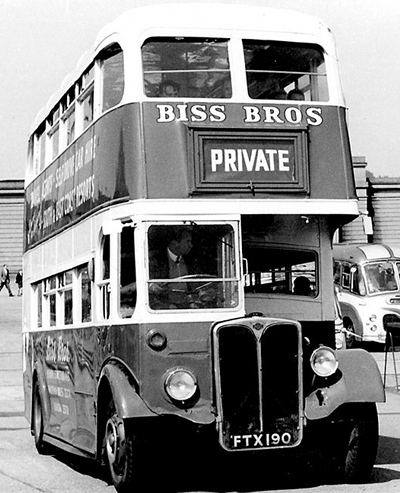 This photograph is of the preserved BDJ 67 which was fleet number 67 in the St Helens fleet. 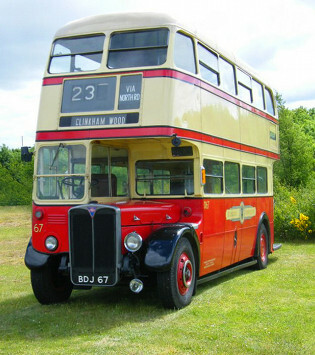 One of Devon Generals 1947 batch of RTs DR327 HTT 327 with Weymann bodywork. The bodywork is like the 20 post-war 'provincial' AEC Regent II STL's supplied to London Transport in 1946. 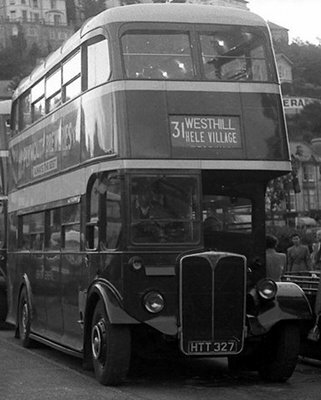 Photograph taken Torquay Aug 1952. Copyright WHOTT Archive/Alan Cross Collection Ref:459K9. 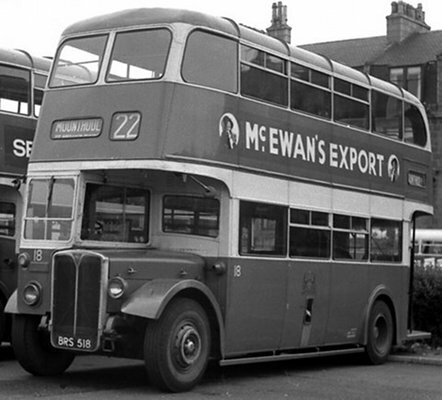 Aberdeen Corporations Fleet number 18, BRS 518, was one of six such buses delivered in 1946 with four more following in 1947 and is here seen at the King Street Garage. Fitted with a Weymann H30/26R body the chassis was of the London 'RT3' style. 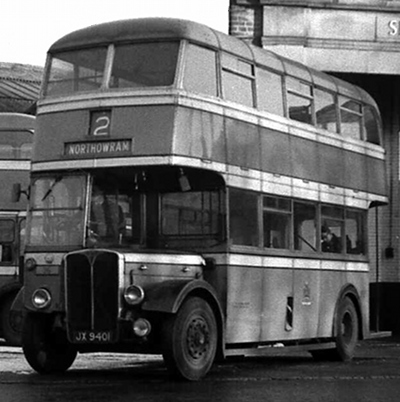 The 1946 deliveries were withdrawn in 1966 whilst the 1947 ones were withdrawn in 1965. All were sold to Hartwood Finance (dealer), Barnsley. Halifax Corporations 36, JX 9401, seen leaving Skircoat Road Garage with a light covering of snow on the ground, was one of eight such buses delivered in 1946. 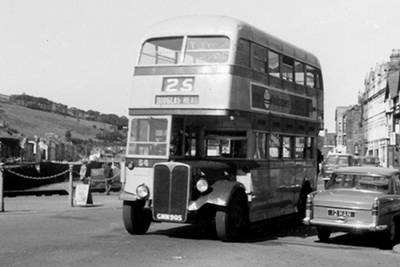 Originally numbered 301, this Roe H31/25R bodied bus was renumbered to 36 in 1952 and was withdrawn in 1959". This rather sad shot is of one of the three Roe bodied RTs delivered to Grimsby Corporation in 1947. 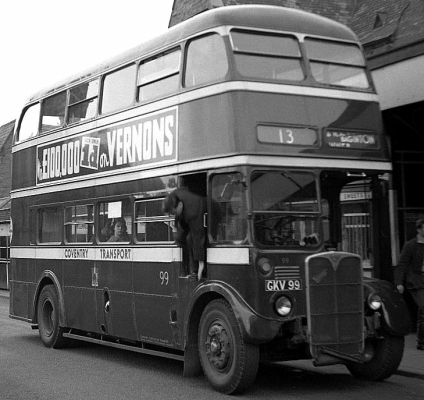 This particular vehicle was registration number JV 9901 which was number 81 in the Grimsby Corporation Fleet which later became Grimsby Cleethorpes Transport Joint Committee. The shot was taken at Sandtoft Trolleybus Museum where it is stored hopefully for preservation by its private owner. Coventry Corporation 99 (GKV 99), the unique Metro-Cammell bodied "RT", 1950 AEC Regent III chassis O961.217, seen at Pool Meadow in Coventry on 6th April 1960. This vehicle was more or less a standard RT, apart from the blind display. It looks sad without the front wheel chrome rings and rear wheel spats. It was withdrawn in 1964. Here is Rhondda 216 - FTX 190, a late-1946 AEC Regent RT O961229/Weymann H30/26R, here with Biss Bros of Bishops Stortford and photographed at Wembley Empire Pool. There is an irony with the registration in that FXT 190 was the registration of RT 15, a 2RT type which entered service with London Transport in 1940! With thanks to Stephen Ford, Andrew Charles, Chris Youhill, David Oldfield, Bob Gell and especially Chris Hebbron for asking such a good question in the first place. This article is open to comments if further information can be offered to the above and any shot of any Non London Transport are more than welcome. All were withdrawn in 1958 and the latest account of them was withdrawal by subsequent operators in 1964, but the PSV Circle history from which this information is gleaned was itself published in 1967! I recently posted a comment about these on the STC site because I've been wondering if the front wings were supplied by AEC. I notice that only those with London style bodies have London style front wings (if that makes sense!) The others appear to have pre-war type front wings and a few have Regent II style wings with the inner edge extensions over the dumb-irons. Was the London style exclusive to that design? In response to Chris's query about the front wings on these vehicles, on London RTs the front mudguards, cab floor, dash, and bonnet were all part of the jig-built body, whereas the tradition for conventional vehicles was for those items to be supplied as part of the chassis. To this end the RT chassis supplied to other operators (except the St Helens ones, of course, as they were standard London RTs) were supplied with a bonnet that resembled that of an RT and a front mudguard that didn't. The bodybuilders weren't particularly happy with this arrangement and the provincial Regent III reverted to the conventional arrangement. Incidentally, with respect to AEC chassis codes, it perhaps ought to be mentioned that whilst the provincial Regent III was indeed model O961/2, the '/2' bit didn't form part of the chassis number, so initially RTs and provincial Regent IIIs were all jumbled up together as O961, thus setting a trap for the unwary. When AEC revised its chassis codes in 1948, the provincial Regent III became model 9612 and the RT, uniquely, stayed as O961. 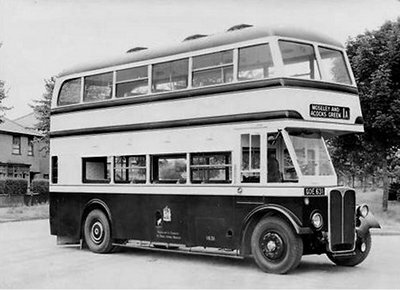 It has always been a matter of some puzzlement to me why London Transport, in 1946, bought 20 Regent II buses of the standard O661/20 type with 7.7 engines and crash gearboxes at a time when RT type chassis were being supplied to provincial operators. Instead, when deliveries of RT chassis from AEC were later outpaced by RT body deliveries, LTE then embarked upon a costly and ultimately futile course of re-engineering the chassis of 160 STLs of 1939 vintage, and fitting these with RT type bodies as they became available from Park Royal to form the underpowered and underbraked SRT class. It would have been far more sensible to have taken RT chassis with provincial bodywork in the first instance, and fitted these later with RT bodies. 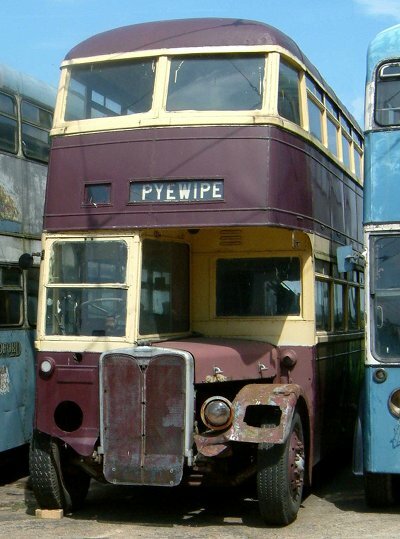 The provincial bodies subsequently removed from the RT chassis would surely have found a market elsewhere within the BTC at a time when wartime bodywork was degenerating on fundamentally sound Guy, Daimler and Bristol chassis. London Transport always seemed to me to be a profligate organisation, a view endorsed when I went to work in the offices of Country Bus & Coach dept. on leaving school after 'A' levels. I take a similar view of the present day transport scene in London. Cambridgeshire County Council has cut local bus subsidies by 100% to save £2.7 million per annum, though this will be eroded by the need to replace lost services with school transport. Northamptonshire has done the same to save £1.4 million, and the story has been repeated throughout the land. At the same time, Boris Johnson is spending £7.8 million for just five of his absurd vanity project Routemasters, that, if they ever see volume service, will further cost 60% more per vehicle than a standard double decker, will have a London life of around five years, and will then be virtually unsaleable on the secondhand market. The various LT manifestations over the years have not had a particularly good track record concerning vehicle procurement. I would defend to the death their desire for a top quality machine for the Capital - often driven by political forces, it being the centre of all government. I would also say unequivocally that they had this in the RT, RF and RM. This included applying their own high standards to the already high quality of Park Royal, Weymann and Metro-Cammell products (not to mention AEC and Leyland). Unfortunately, LT has always had a blinkered view of it's own superiority - and yet not always been consistent. They tacitly admitted the quality of standard Weymann and Leyland with the 1946 Regent IIs and PD1s. There is, therefore, no logic to not accepting RTs with Provincial bodywork - much of which was by Weymann and some by Park Royal. LT subsequently compounded their poor record with both the Merlin/Swift saga and the Fleetline farce. The Merlin/Swift was a very poor second to the Bristol RE but was still better than the rest. What it couldn't do was fit into the rigid LT refurbishment regime. (What worked well for RTs and RMs didn't for modern rear engined models). [There were some major design bungles on the Swift - but it was a new concept.] The Fleetline wasn't a bad bus, but it simply didn't fit the regime. A very good friend of mine, senior in one of the major groups, is, like me a huge fan of AEC and the traditions of LT. He is, however, one of the first to say that LT had to be dissolved - whether or not what we currently have is better - because management practice made it unwieldy and untenable and many strategic decisions (including vehicles) were quite frankly barmy! My understanding of the purchase of the "provincial" STL's was that LPTB, like everyone else, had an aging fleet, which was falling to pieces, and they were willing to take suitable replacements off the shelf, so to speak. They then decided to have their post-war RT bodies jig-built, which delayed production by about a year. The conversion of the STL's to SRT's came about in 1949 because chassis production was exceeding that of bodies. It was a disaster, for the most modern and best STL's were shorn of their bodies, which were transferred to older metal-bodied STL's, whose bodies were rusting away. The STL chassis were extensively and expensively altered, (including altering the floor-mounted gearlever to the steering column type and swapping the fuel tanks to the other side) and fitted with surplus RT bodies. These weighed over a half-ton more, making the vehicles under-powered (7.7 and not 9.6 litre engines) and under-braked. They were relegated to flat routes and the conversion programme was never finished. The intention was to keep them for some years, and overhauls even started, but, in the end, after some five years, the chassis were scrapped and bodies put on RT chassis. And to come back to Roger's point about profligacy, why weren't these vehicles sent to Country Services, with less challenging stop-start conditions? I recall reading once about three newly-overhauled red STL's being put on a very challenging, hilly, short route, only for them to declared inadequate, being replaced, poste-haste, by RT's. And what happened to the pristine STLs? They were promptly sent to Country Services and repainted green! This red/green thing was always happening. And, on its uppers, modern fleet-wise, one of the first things which LT did, when peace came, was to dispose of all its non-standard buses, one or two of which were later hired back to cover fleet shortages!I feel that nationalisation in 1948 brought about later inefficiency to a large extent, which merely got worse, culminating in the decision the sideline the FRM and buy buses not up to the "London" challenge. We then had political interference, but that's another story. From a young bus enthusiast's viewpoint, however, I loved the whole post-war scene! Picking up the point made by Chris Hebbron, I too was fascinated by the early post-war London scene. I was a young enthusiast "looking in" on London through the wonderful pages of "Buses Illustrated" in the 1950s. If the 7.7 Weymann STLs could be sold off to Widnes, Grimsby et al, why could the post war STD type have been similarly sold in thg UK? There seems to be so much confliction where supposed LPTB policy is concerned. As a matter of interest, the Glasgow Weymann 1939 RT, 729, was available for many years as a Modelcraft card kit, a copy of which I still have and am thinking about building if my eyesight holds up! Does anyone know if this vehicle differed mechanically in any way from the pre-war RTs? I think I read somewhere that the "Provincial RTs" were made available to the wider market in 1946 as a taster of the forthcoming 0961 Regent 111 which was not yet available in 1946. It was 1947 before this model became commercially available. I've only just found your post, John and been able to fill in the picture. Once the publicly-owned London Transport was nationalised in 1st January 1948 (along with the four railway companies), restrictions applied in that it could not sell used vehicles to competitor BET, thus restricting its market to municipal/Tilling operators: thus a pattern emerges. Austerity Bristols went to Crosville, Lincolnshire (2 passed on to United, Hartlepool) and BH&D (one passed on to United, Hartlepool). Most acquired ECW bodies. The best-bodied (Northern Counties) austerity Guys went to the Atomic Energy Authority etc. and others went to Scotland; Alexanders and Western SMT, with a few to Edinburgh Corporation. Others were scattered around the world, to Jugoslavia, Ceylon, Kenya and Southern Rhodesia. Most of the Daimlers (D's) went abroad, with 100 going to Belfast Corporation (re-bodied by Harkness) bodies, with a sprinkling lasting long enough to suffer destruction in the Ulster 'troubles', never having suffered in WWII! The STD's you mentioned, John, went to Jugoslavia. The twenty Weymann STL's went to Widnes (4), Grimsby (6) and Dundee (10) municipalities. The net result of this madness, is that much of BET and provincial UK were deprived of newish buses they would dearly loved to have got their hands on, for the short-term. Many of LTE's buses had had their austerity bodies rebuilt and would have been a Godsend. As for the Glasgow 'RT', I didn't realise that there was a model of it. The body, although by Weymann, had a Cowieson look around the front destination blind box. Its place in the building timetable was as follows; prototype RT1 was delivered to LPTB in June 1938 and was extensively road-tested and modified. Production of RT2-151 (chassis 06616750-06616899) started in the Summer of 1939, with the Glasgow 'RT' chassis (06616963), plus body built/fitted, planned ready for the Commercial Motor Show, usually held mid-November, but cancelled). However, chassis numbers were issued upon confirmation and it was scheduled to be built in the Summer, so it is likely that it was built as part of the 2RT production run, judging from the dates below. The first two chassis were delivered to Chiswick on 13th October, with London's RT's going into service on 1st January 1940. 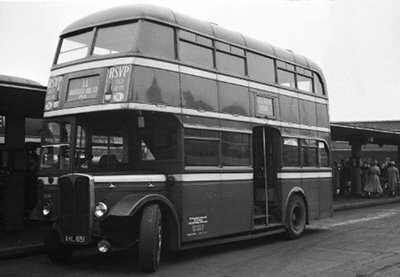 The Glasgow 'RT', with body, was delivered in early February 1940 (though possibly not put into service until the July - see below). I would imagine that it was also fitted with 'panic' replacement dynamo instead of the worn-drive German Bosch one, in RT1. The, also, worm-driven replacement proved inadequate at maintaining the bus's electrical demands and resulted in LPTB's fleet being taken off the road for some time until an adequate belt-driven replacement for sourced and fitted, with much modification! It may also account for the delay in putting the Glasgow one into service. At the end of the day, I'd say, therefore, that the Glasgow 'RT' it was built to 2RT spec. Sorry if this goes on a bit! Anyway, do make the model, John. I'm sure we'd all like to see the finished model of a unique bus, which stayed in service until sold on in 1956. I'm not querying historical fact, but I am a little concerned at the mathematics. You have stated that 'about 70' RT-type chassis were supplied to provincial operators in 1946-47, but adding the various totals (and including the one for Coventry) only accounts for 62. Did you add a factor of safety for possible extras? On the other hand, a batch of 15 for St Helens followed by one of 25 - doesn't that make 40 rather than 35? Welcome to our website, David, and your first post, I believe. This sub-thread, extracted from another subject, started as an unknown, using conjecture and a list, which, as later posts and information came in, resulted in the table being adjusted, but not the posts. If posts were altered, the thread would become illogical and therefore nonsensical. If you have been able to work out the true situation from the table, which is ultimately correct, others before you, who have not commented, and those who will follow you, can also, I venture, do the same. By my reckoning the total is actually 102 - i.e. 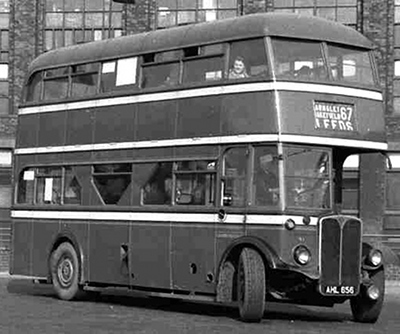 62 RT chassis with provincial type bodies supplied by a variety of manufacturers, plus 40 new "off the peg" London Transport design RTs supplied in two batches to St Helens. One thing which I've only just noticed is that the Weymann bodies on the Aberdeen and Rhondda vehicles were of four bay construction. Given that many operators, London Transport included were recieving Regent II's with standard Weymann five bay bodies at the time, I never realised that both four and five bay bodies were in production at the same time although I don't recall seeing any provincial Regent III's with five bay bodies. Chris. Four bays were an RT thing but four bay provincial Weymanns were a post 1947/Regent III thing. The non LT RTs were, for the most part, 1946 in a time when Weymann were producing five bay bodies for provincial machines - such as the Regent II and PD1. Can anyone recall any four bay bodies pre-war. I've a feeling I have seen photos of a couple in the '38-'40 period. Roe introduced their four bay as a Leeds/Motor Show exhibit in 1937/8(?). Roe was certanly one model in my mind, with lovely large windows, I seem to recall. Bodies of this late pre-war period were often very handsome, David. 0961.018, Naylor of South Normanton had MRB 709 with Brush H30/26R body delivered Dec 48. 0961.088, Ebor of Mansfield had HRR 242 with similar Brush body, and according to this page MRB 709 was also likely ordered by Ebor but sold before delivery. My suspicion is that despite the early chassis numbers these may be later model chassis. Re John McSparron's post, the bonnet line of MRB 709 in this photo https://flic.kr/ shows that the chassis wasn't an RT. (Very fine-looking bus though!) The chassis number of HRR 242 was actually O961.188 rather than .088, although it still fell in between the Douglas and Birmingham RTs.